Choose from a steel, polymer, or aluminum reservoir with a 50 gal or 70 gal capacity. All versions come with a cast iron pump/valve .assembly rated at 46 GPM at 1800 RPM. 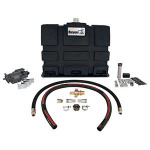 The wetline kit includes: (1) Upright reservoir; (1) Frame bracket kit with fasteners; (1) Reservoir isolation package; (1) 46 GPM at 1800 RPM cast iron pump/valve combination with brackets; (1) 6 ft internally reinforced 1-1/4 in. suction hose; (2) 1-1/4 in. barbed adapter fittings; (2) 1-1/4 in. stainless steel hose clamps; (1) 1 in. high pressure swivel adapter; (1) 1 in. wing-type high pressure quick detach coupling; and (1) 1 in. high pressure hose, 6 ft long.